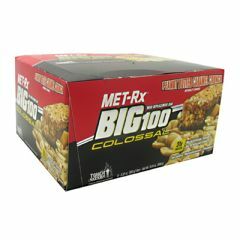 AllegroMedical.com presents The MET-Rx Big 100 Colossal - Peanut Butter Caramel Crunch Meal Replacement Bar. Naturally flavored meal replacement bar. No artificial flavors or colors. 32g of protein- includes metamyosyn protein! Caramel Layer (Corn Syrup, Sugar, High Fructose Corn Syrup, Sweetened Condensed Milk, Palm Kernel Oil, Milk Protein Concentrate, Butter, Vanilla, Soy Lecithin, Salt), Whey Crisps (Whey Protein Concentrate, Corn Starch), Soy Crisps (Soy Protein Isolate, Tapioca Starch, Salt), Chocolate Flavored Coating (Sugar, Vegetable Oil, Cocoa Powder, Whey Powder, Nonfat Milk Powder, Soy Lecithin, Natural Vanilla), Corn Syrup, Natural Flavors, Dry Roasted Peanuts, Glycerin, Milk Chocolate Drops (Sugar, Whole Milk Powder, Chocolate Liquor, Cocoa Butter, Milk Fat, Soy Lecithin, Natural Vanilla Flavor), Water, METAMYOSYN V100 Protein Blend (Whey Protein Isolate, Milk Protein Isolate, Whey Protein Concentrate, Dried Egg White, L-Glutamine), Peanut Flour, Wheat Germ, Vitamin and Mineral Blend (Ascorbic Acid, d-Alpha Tocopheryl Acetate, Niacinamide, Tricalcium Phosphate, Zinc Oxide, Copper Gluconate, d-Calcium Pantothenate, Vitamin A Palmitate, Pyridoxine Hydrochloride, Thiamin Mononitrate, Riboflavin, Folic Acid, Biotin, Potassium Iodide, Cyanocobalamin), Xanthan Gum, Dipotassium Phosphate, Natural Almond Butter. Contains milk, egg, wheat, soy, peanut and tree nut ingredients.